Our Lady of the Holy Souls recap and photo gallery. Hold on to your butts! 19th & Tioga, in the (gulp) Nicetown section of North Philadelphia. That’s right, dear readers. What better way to spend a Sunday than venturing into the dankest corners of the inner city, to places best left forgotten? There isn’t! That’s why I chose to worship this week at Our Lady of the Holy Souls. A valid question. 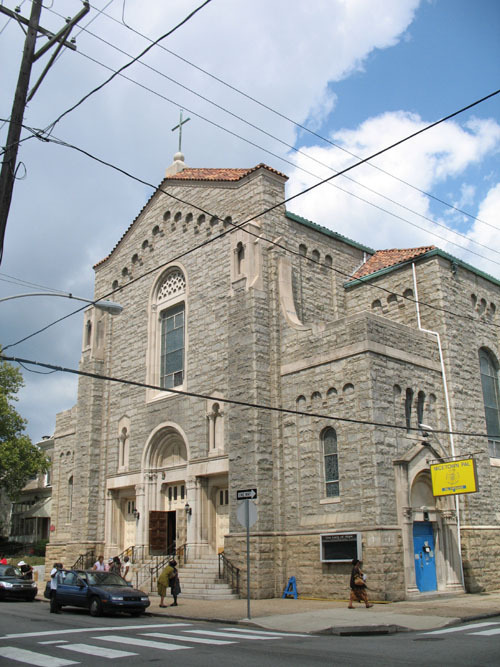 Holy Souls was indeed a victim of the North Philadelphia Swath of Destruction, circa Year of Hell. But the story doesn’t end there. 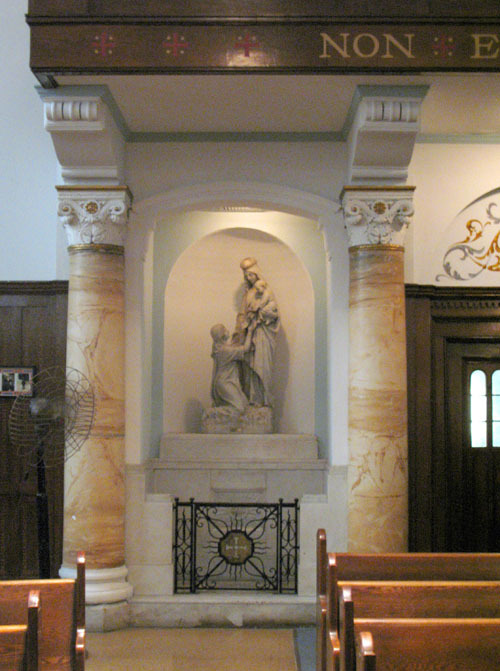 The parish was consolidated with neighboring St. Stephen and Holy Child to form the new Our Lady of Hope. 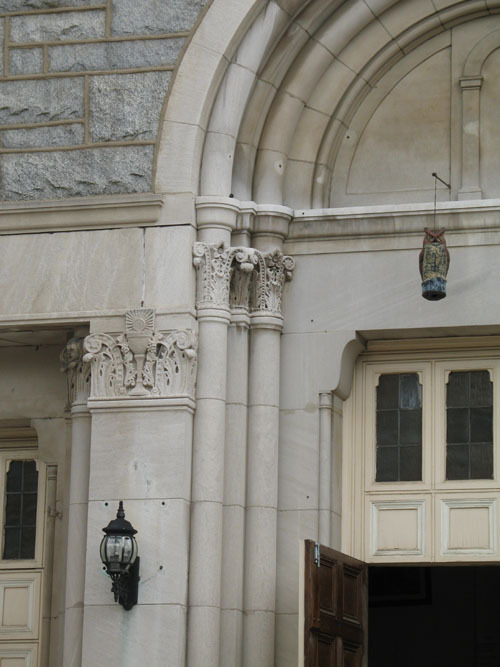 The Archdiocese apparently didn’t want to give the appearance that they were abandoning the inner city (despite all evidence to the contrary), so they kept Holy Souls’ building operational as a worship site for Our Lady of Hope. The Project is naturally a fan of preserving a parish’s history and lineage, so I’m at a loss to understand why Holy Souls didn’t get the same benefit that Mary Magdalen did. Come on, Archdiocese. I may dislike your methods, but you could at least have the courtesy to be consistent with them. 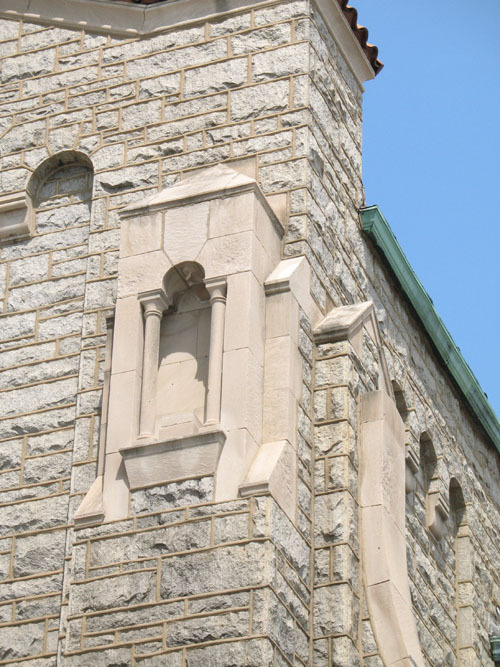 Anyway, Holy Souls is a church that’s very much a victim of its checkered past. It’s a smaller building that looks to have been Italian-Renaissance at one time. The problem is that Holy Souls is a sterling case of Pimp My Church, with healthy amounts of Tabula Rasa thrown in. 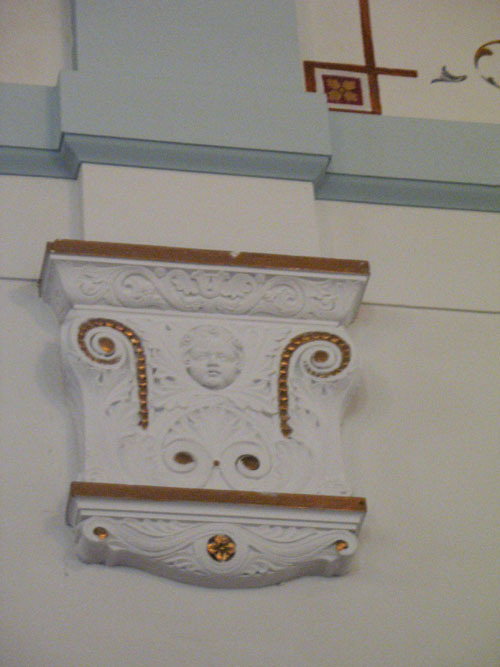 It’s clearly gone through several décor alterations since its inception, both to the ornamentation and the layout. 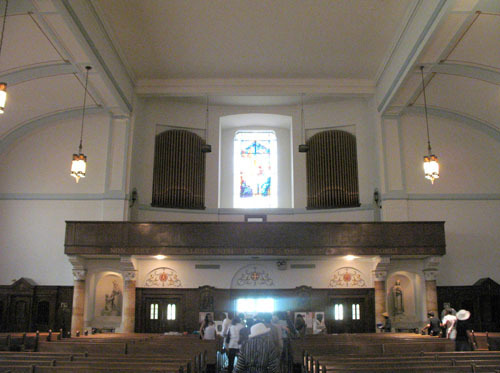 The mostly-white paint job, the expanded altar section, blue carpet and slanted side pews are certainly not the work of 1922 architects. So what’s left? Well, a neat altar piece, for one. But the real attraction here is the stained glass, which is absolutely gorgeous. It features the same detail and depth that the best sets do, but the nave set is also ridiculously wide — far wider, the Project thinks, than any set we’ve seen previously. It’s not enough to make it truly deserving, but the remaining traces of the past are still worth seeing. Just temper your expectations. See Hope, Our Lady of. 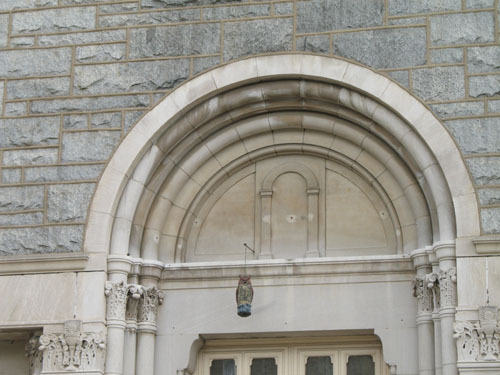 The parish is still struggling with crumbling buildings and bad locations. This building isn’t quite the quagmire that the main one is, but there are obvious spots of water damage on the ceiling and in the corners. 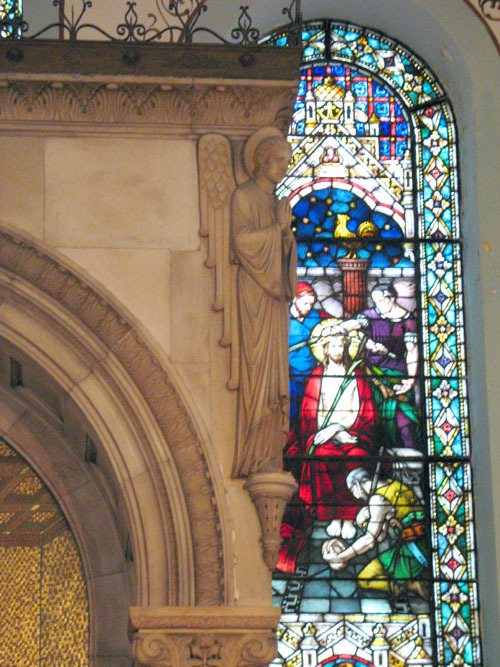 That’s not surprising, since many of those beautiful stained glass windows are showing alarming traces of bulging and bubbling. If they don’t get them fixed, and fast, I foresee a Plexiglas solution in their future. As for attendance, the numbers keep spiking somewhat, but are still in the 400-500 range. Not sure how many of them use this building, however. And while I think Our Lady of Hope will probably survive in one form or another, I can't say the same for what is an extraneous worship site. The parish doesn't even seem to hold regular mass here anymore, which is an ill omen indeed. The Outsider's Edge: Of course. It’s 19th & Tioga; I can’t go anywhere around here without attracting attention. This time the Project was accosted by a couple of members, who politely inquired as to why we were there and encouraged us to come back after August, when their gospel choir gets back from vacation. Oh, and while taking some exterior shots, a different member loudly asked if I was going to fix up the church. Sorry, guys. I would if I could. You could always go ask the Archdiocese...ah, never mind. Well, it’s not exactly for the faint of heart. It’s at 19th & Tioga, which will probably scare off all but the most determined pilgrims. Two churches, one parish, two almost-identical inscriptions. Is it just a coincidence? Or was Holy Souls’ version added after the merger, to bring some unity to the new parish? Some good stuff, but not particularly noteworthy.